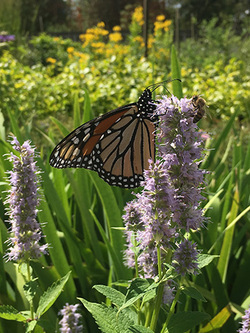 Stephen F. Austin State University's SFA Gardens will host a Saturday Seminar on wildscaping for pollinators from 9 a.m. to noon Sept. 22 at the Brundrett Conservation Education Building at the Pineywoods Native Plant Center. NACOGDOCHES, Texas - Stephen F. Austin State University's SFA Gardens will host a Saturday Seminar on wildscaping for pollinators from 9 a.m. to noon Sept. 22 at the Brundrett Conservation Education Building at the Pineywoods Native Plant Center. "Pollinators are responsible for one out of every three bites of food we eat, but their populations are threatened with serious decline," said Dawn Stover, SFA Gardens research associate and pollinator plant specialist. "Anyone can help native pollinators by planting their own backyard pollinator habitat." During the seminar, Stover will present how to effectively garden to attract pollinators. Participants will learn about the different kinds of native pollinators and other beneficial insects and their roles in the garden. Stover also will explore appropriate plants to use and effective gardening techniques to maximize pollinator participation in the garden. The workshop will include a hands-on opportunity to make pollinator-friendly seed balls and an option to tour pollinator plants in the landscape and nursery at the PNPC. Participation for the garden design seminar is limited, and advanced registration is required. The cost is $25 for SFA Gardens members and $30 for non-members. Call (936) 468-4129, or email sfagardens@sfasu.edu to reserve a seat.